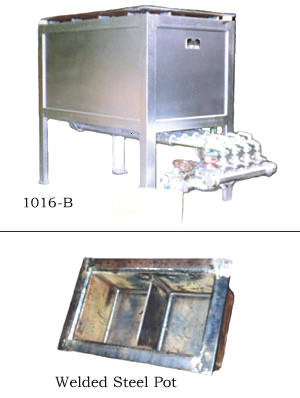 Rectangular Lead Furnace Melters | Charles A. Hones, Inc. 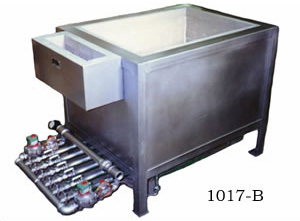 The rectangular melting furnace can be used for melting salts for heat treating, tempering and quenching applications, or for melting low temperature metals such as pewter, babbitt, solder and lead. Rectangular melting furnaces can be used for up to 1,250 degrees F and come insulated with 2 1/2″ of firebrick. Pot fabricated of 1/2″ thick milled steel included. No. 1017B: Pot is 24″w x 36″l x 24″h. Holds 1,000 lbs. of salt or 6,000 lbs. of lead. Maximum operating temperature 1,250 degrees F.
Base list price with digital controls and high limit safety is $34,102. No. 1016B: Pot is 12″w x 24″l x 12″h. Holds 175 lbs. of salt or 1,000 lbs. of lead. Maximum operating temperature 1,250 degrees F.
8 standard sizes available from 500 lbs. lead capacity to 6,000 lbs. lead capacity. Special sizes built to order.